This support group meets for the encouragement, education, and advocacy of Patients with Chronic Kidney Disease; Pre-Dialysis, on Dialysis, Pre or Post Transplant, their family members & caregivers. 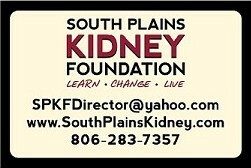 Please contact your Dialysis Center Social Worker or Amie at the South Plains Kidney Foundation 806-283-7357. See the flyer here. Kidney Disease Possible Symptoms. See info here. CKD Stages. See info here. CKD Nutritional information. See info in English here. See info in Spanish here.